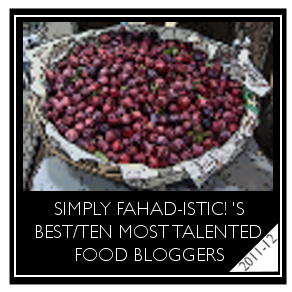 Liquid Friday: Spiced Pomegranate Sangria by 'Rashmi Primlani' - Simply Fahad-istic! Puzzling,isn't it?I personally have a hard time wondering why do some people let spices intimidate them!Are you one of them too?If yes is your answer,do not worry - Rashmi Primlani from Primlani Kitchen ,creator of #spicychat ,who knows spices like the back of her hand is here to help you! Fellow foodie from my home town @Pharaohkhan of Simply Fahad-istic has introduced a series called Liquid Friday, with the aim of introducing new concoctions alcoholic or non-alcoholic on Friday's to share with your friends and family. As no meal is complete without a touch of spice, Fahad graciously ask me to create a drink of my liking to compliment my own #spicychat series.What perfect timing! With the holidays round the corner, I am constantly seeking new variations with seasonal produce on the classic combinations that are especially designed for crowds. Pomegranates and apples are both in season; ripe, sweet, boasting gorgeous hues, soaked in pomegranate wine, lightly spiced with cinnamon, star anise, and black pepper; the result, a strong but not overly sweet sangria that is an ideal start to your holiday gatherings. If you can't find pomegranate wine substitute with any dry and fruity red wine. Actually pomegranates taste excellent with sparkling wine too....Indulge in some champagne. This is a super easy make-ahead cocktail which will certainly kick start your holiday party. Start the festivities with a snazzy cocktail! Pomegranate & Apple spiced sangria is a fabulous way to entertain crowds. The wine-soaked apples get even more delicious as they spend more time in the pitcher. Feel free to double the recipe according to the number of guests. 1. In a large pitcher combine all the ingredients for the sangria and stir until combined. Chill overnight. 2. To serve, fill glasses with ice, pour the sangria with fruits, top with sprite or sparkling water. Serve immediately.